Michael was introduced to boating while spending his first 18 summers in Cape May, New Jersey working in his fathers shipyard and mating on his boats. After graduating from business school in Boston with an MBA degree, Michael owned and operated a sport fishing boat for five years between Palm Beach Florida and Nantucket, Massachusetts. Michael then went into the Merchant Marine and earned his 1600 ton master’s license. He then spent 10 years as a yacht and ship captain including three years as captain of a U.S. Navy research ship. Michael then returned to Palm Beach and started a marine service business and began his career as a yacht broker. From 1990 till present Michael has worked for two prominent yacht brokerage firms and most recently has joined IYC in Palm Beach, Florida. 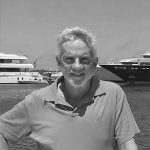 With 30 years in the yachting business, Michael is well positioned to help his clients in all aspects of yachting including sales, service and new build projects.